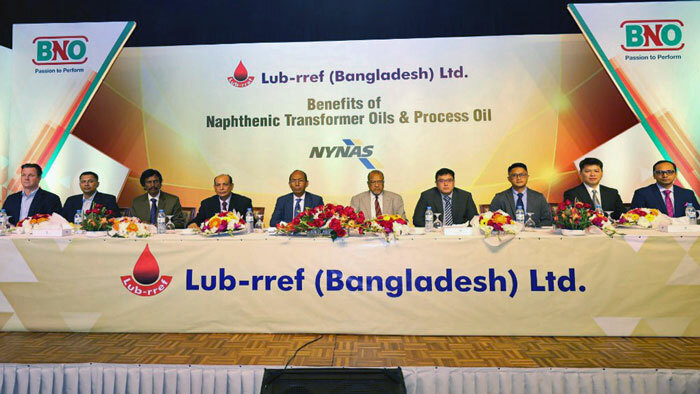 Photo courtesy of Lub-rref (Bangladesh) Ltd.
Lub-rref (Bangladesh) Ltd., which markets lubricants under the BNO brand, has introduced Nynas transformer oils in Bangladesh. The launching ceremony was held last Sunday in the capital city of Dhaka. Mohammed Yousuf, managing director of Lub-rref (Bangladesh), presided over the launch with the presence of special guests Charlotta Schlyter, ambassador of Sweden, and Kazi M. Aminul Islam, executive chairman of the Bangladesh Investment Development Authority (BIDA). Currently, Lub-rref (Bangladesh) offers a wide range of products including passenger car and heavy-duty engine oils, marine lubricants, gear oils, hydraulic oils, four-stroke motorcycle oils, compressor oils, and specialties. Nynas, which is headquartered in Stockholm, Sweden, produces naphthenic oils from four refineries in Europe – Nynäshamn and Gothenburg, Sweden; Harburg, Germany; and, Eastham, UK, a joint venture plant with Shell. Currently, Nynas has 23 depots around the world, of which Antwerp, Belgium; Houston, Texas; and Singapore are its central storage facilities and blending stations. Last year, Nynas transported some 700,000 tons of oil by sea. There were also 30,000 deliveries by road tanker, 6,000 container transports and 250,000 drums delivered to customers all over the world.